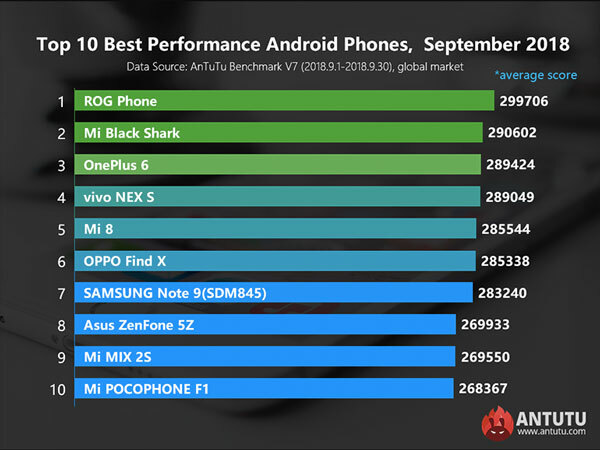 AnTuTu recently released its report on the top 10 best performing Android smartphones for the month of September 2018. The AnTuTu Benchmark app is one of the more popular (if not the most popular) benchmarking tool for both Android and iOS. It is often used to assess and compare the performance and raw power of smartphones relative to each other. Recently, AnTuTu released its September list of most powerful Android phones. And like last month’s results, the top ten are all powered by Qualcomm Snapdragon 845 processors. This month’s number one is the ASUS ROG Phone with an average score of 299,706. The gaming smartphone comes with a Snapdragon 845 processor with 2.96GHz clock speed, 8GB LPDDR4X RAM, and up to 512GB UFS 2.1 storage. It also features a vapor cooling system that allows it to perform at max without worrying about heat. Next on the list is the Mi Black Shark with 290,602 points. Last month’s number 1 is also a gaming phone. It too comes with a Snapdragon 845 processor, up to 8GB RAM, and up to 128GB storage. This one also features a cooling system to manage temperatures. Sitting at third is the OnePlus 6 with 289,424. It has similar specs as the first two smartphones with a Snapdragon 845, up to 8GB RAM and up to 256GB UFS 2.1 storage. The next Android phones on the list is the Vivo NEX S, the Xiaomi Mi 8, the OPPO Find X, the Samsung Galaxy Note 9, the ASUS ZenFone 5Z, the Xiaomi Mi Mix 2S, and the Xiaomi Pocophone F1. This October could be the month where a non-Snapdragon 845 Android smartphone enters the list. Both the Huawei Mate 20 and the Mate 20 Pro are now official, bringing the 7nm HiSilicon Kirin 980 processor with it. Initial reports are already placing it at either one or two with scores close to 300K. Eight of the ten phones on the list are available in the Philippines. The Vivo NEX S and the Mi Black Shark are probably available in online stores. AnTuTu sets statistical rules to qualify. Scores are averaged, and collected from September 1 to 30, 2018. At least 1000 units should be tested using AnTuTu Benchmark V7.